Fight visible lines, wrinkles and other signs of ageing with the DHC Q10 Cream; ideal for maturing or stressed skin types. 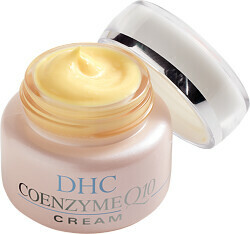 DHC Q10 Cream has been formulated with DHC's highest concentration of super-anti-oxidant co-enzyme Q10, which plays a vital role in promoting cell renewal and regulating collagen production to keep skim firm and supple. Q10 is a natural enzyme produced by our bodies to fight free-radicals. Over time our bodies ability to produce the same levels of Q10 declines and small signs of ageing begin to appear. Using a Q10 rich cream will provide your body with a boost of vital Q10 to help fight the signs of ageing. This lightweight, easily-absorbed cream has been blended with nourishing emollients and Olive Oil to maintain tone and resilience for a softer, smoother looking complexion. After cleansing and toning, apply smoothly and evenly over face. For optimum results follow use with other DHC Q10 products.